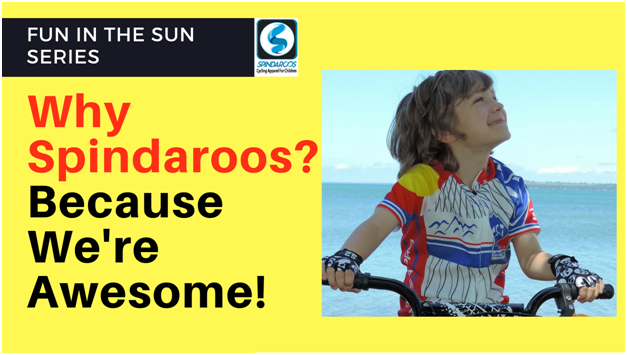 Fun In The Sun Series - Why Spindaroos? All of us here at Spindaroos think we’re pretty darn cool. I know, I know…it’s a little weird to pat yourself on the back for being awesome, but we can’t help it! We love what we do and most of all, we love why we do what we do… it’s all for the kids. Encouraging movement and healthy habits for children is one of our main priorities at Spindaroos - and creating cool gear to help them feel confident and comfortable as they move, play and cycle is a goal we take very seriously. It’s a fact that children need to be physically active each day. They need at least 60 minutes of movement, whether it be playing outside, riding their bikes, running around with friends, hiking, playing hide and seek - any activity they prefer that gets their heart pumping is perfect. Chasing, running, cycling, playing tag - all of these are perfect examples of activities that kids can do to work their arms and leg muscles, but the heart muscle is one of the most important body parts that kids should be working regularly. Not only will a having a healthy heart help kids feel strong physically, exercise helps kids feel strong emotionally and mentally! There have been multiple studies that point to the fact that children who partake regularly in sports have a more positive outlook, do better in school and are more outgoing. Being part of a team and learning to work together to achieve a common goal is an important set of tools for kids to have for life! Today we find our kids being interested in ‘screen time’ often times more than being physically active. Screen time can mean watching television, sitting in front of a computer playing a game or hanging out on their phone texting or looking through social media. There is a time and place for these activities, but as with everything in life, these must be done in moderation. If you notice your child has picked up a habit of sitting in front of a screen, especially with this being summer, for more than an hour a day, perhaps it’s time to encourage them to choose another activity. We know that during summertime, filling their days with activities can be exhausting for you, and if we’re being completely honest here, having the kiddos sitting and watching a movie or two, or playing on the game console frees us up for doing things that we need to do. That’s why it’s alright for the kids to have some screen time each day which can act as a buffer to allow mom and dad to get their stuff done, but too much of anything is not good…especially when it comes to sitting in front of a screen for too long. Setting boundaries with screens is imperative. And besides, getting out of that slump and moving your body around just makes you feel good! This brings me back to my initial point, which is that Spindaroos is really AWESOME ! We know that kids need to move and play. But it’s not just that - we know that kids really LOVE to move and play and we have gear that helps them stay cool and look cool. Check out our cycling jerseys, cycling gloves, bike shorts, unis, cycling jackets, and more for the latest and super greatest in kids’ cycling gear. Your kids will love the dynamic colors and designs and you’ll love to see all the cool activities your kids are going to do in them!